As this is the primary goal of the PHK project, using a PHK package does not require high skills in PHP. Basically, a PHK package is used like a PHP script. It can be run in CLI mode, though a web server, or included from another script. Most PHK features don't require any specific action from the end-user, as they are generally planned and configured when the package is built. When you receive a PHK package, you will generally also receive some information explaining where it should be located and how it can be used. Generally, you don't need any other information but, if you are curious or encounter problems when using a package, this document gives the information needed to understand and troubleshoot PHK usage. In order to use a PHK package, you need PHP version 5.3.0 or more. This version is required because the PHK code is using PHP namespaces. If the PHK package requires PHP extensions which are not already loaded, it will try to load them using dl(). If enable_dl is off or safe_mode is on, the dl() calls are forbidden and fail, triggering a fatal error. In this case, you must add the required extensions in the php.ini (using 'extension=' directives). Every other 'ini' directives should be compatible with PHK. If it is not the case, please report a bug. This chapter applies only if you want to access a PHK package in web direct access mode (see the 'access modes' chapter below). 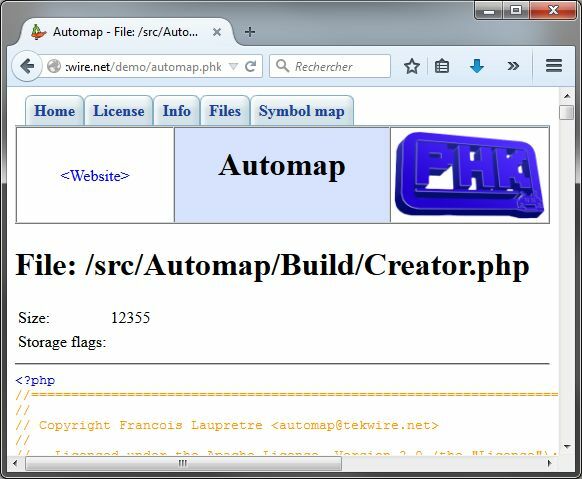 the best one, possible if you have full control over your server configuration, is to configure your server to recognize '.phk' files as PHP scripts. The procedure for Apache is to add a line containing : 'AddType application/x-httpd-php .phk'. The alternative, if the option below is not possible, is to rename your PHK packages with know suffixes (typically '.php'), so that they get recognized correctly. When doing this, prefer adding '.php' after '.phk', so that something still indicates that the file is a PHK package. You would, for instance, rename 'hello.phk' to 'hello.phk.php'. The risk, if you remove the '.phk' part, is to see someone open the file, see some weird content inside, and throw it away as a corrupted PHP script. If some of the package's subfiles are compressed, you will need the corresponding extension(s) to run it (zlib and/or bz2). Note that the package cannot start executing until all of its required extensions are present. You shouldn't need anything else to use a PHK package. As it was said before, the runtime code is contained in the package. If you want to improve performance, you should install the PHK PECL extension. Of course, it is possible only if you have full control over your PHP installation. There is nothing to configure as the extension is automatically detected and used by the runtime code. Just download, compile, install, and activate in your php.ini file. Then, restart your web server, and use a phpinfo() call to check that the extension is active. The increase in performance can be very important, up to 100 times faster, depending on the application. Work is still in progress to improve the performance of PHK packages. As with any PHP source file, there are three ways to access a PHK package. These modes are detailed here because some behaviors depend on the way the package is accessed. In this mode, the package is included from another PHP script. This is the typical mode for a library or a plugin. That's why this access mode is also called 'library' mode. When a PHK package is included/required from another PHP script, it will try to execute the script defined by the 'lib_run_script' option (if this option is defined). and on other OS : by any way using the CLI PHP interpreter. Although PHP is used primarily as a web language, it is also an excellent general-purpose programming language. Another example of using PHP in CLI mode is PHP-GTK. When run as a CLI program, a PHK package tries to run the script referenced by the 'cli_run_script' option. Note: if a PHK package is included from another source file in CLI mode, we consider it is included, and we are in the previous case. 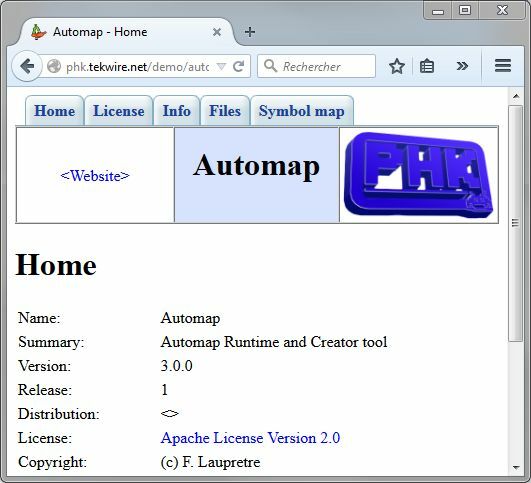 In this mode, a PHK package is executed by a web server, typically via a SAPI like CGI or a web server module like 'apache2handler'. This mode includes every SAPI except CLI. This mode is more complex as the PHK package is accessed using an URL. Here, the PHK runtime acts as a controller in MVC terminology. the first part gives the path to the PHK package. the second part gives the path of a subfile inside the PHK package. In such an URL, '/virtual/path/to/file.php' is the virtual path of the requested file, inside the package. When accessed in direct web mode, the PHK package is seen from the end-user as a virtual file tree. When loaded in direct web access mode, a PHK package tries to run the script referenced by the 'web_run_script' option before searching for the requested subfile. 1. Virtual directories cannot be listed from the web. If you specify the path of a directory in web direct access mode, you get an error. 2. The requested path is filtered through a list of 'authorized' paths. This list is defined by the package's 'web_access' option. Any request for a path which is not specified as authorized is discarded (or sent to the 'web_run_script' if it is defined). Thanks to this, it becomes easier to increase an application's security level. This feature can only help increasing your security level, and will be effective only when used as a complement to the right security techniques. As PHK implement a virtual file tree, it has the responsibility to determine which mime-type to return to the client when a subfile is requested. For this purpose, it defines a default table of mime types to associate with the most common file suffixes. See the documentation for the mime_types option in the PHK builder's guide to see this default table. If the default table does not contain every mime type you intend to return from your PHK package, you can specify the missing types using the mime_types option. The webinfo mode is a special subcase of the web direct access mode. What we saw previously was the usual execution mode. In order to switch your package to webinfo mode, you just create another (empty) file, in the same directory as the package file, whose name is the same as the PHK package's with a '.webinfo' suffix appended. This file is in execution mode by default : if you call it through your browser, it will behave the way intended by the package's builder. The content of this new file is never used, he just has to exist in the same directory as the PHK package. Now, as long as the '.webinfo' file exists, the PHK package's behavior is completely different : When it is run through a web browser, it does not execute its software any more. Instead of this, it displays a small embedded web site, where you can see all its characteristics. Why is it done this way ? Why isn't it just an extension of the 'normal' execution mode ? The main reason is security. The webinfo mode displays every aspect of a PHK package and it is also a way to display the package's help, license, source code, etc. But, this access must be restricted as some of this information can be interesting for hackers. That's why both modes are mutually exclusive. You cannot forget to switch the webinfo mode off, as your package cannot run normally as long as this mode is active ! does not require a shell access to the installation directory, and can be switched on/off through an FTP connection. If you want to keep a package running in execution mode and, at the same time, analyze it in webinfo mode, you must make a copy of your PHK package under a different name and/or in a different directory, and create the webinfo-enabler file to match the new name and/or location. Symbolic links don't work in this case. Now, webinfo mode is on. How do we display all this information ? As we said before, just point your browser to the PHK package behind a PHP-enabled web server. It should display the webinfo home page. Several pages can be displayed, by clicking on the tabs on the top of the screen. This is the first page you display when accessing the PHK package in webinfo mode. 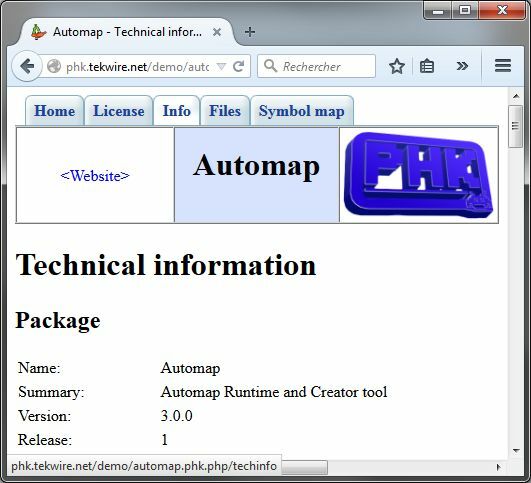 The packager has the possibility to provide a PHP script to be executed and displayed on this page (through the info_script option). If this option is not set, the page displays some general information about the package : name, summary, version, etc. If a documentation is included in the package (e.g. if the help_prefix option is set), this page will display it. If an HTML documentation has been provided, this page can contain any HTML content, including images and hypertext links (internal or external to the package). 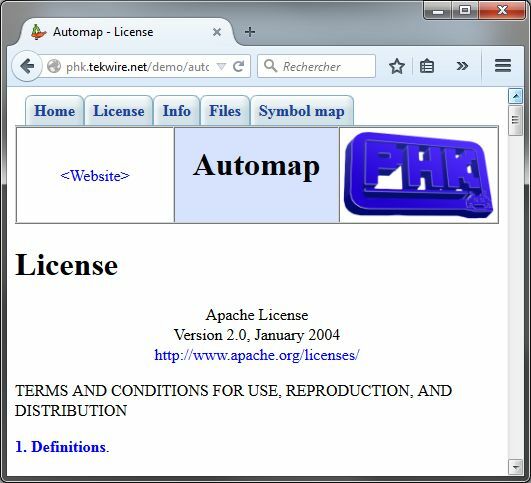 This page is displayed only if the license_prefix option is defined. 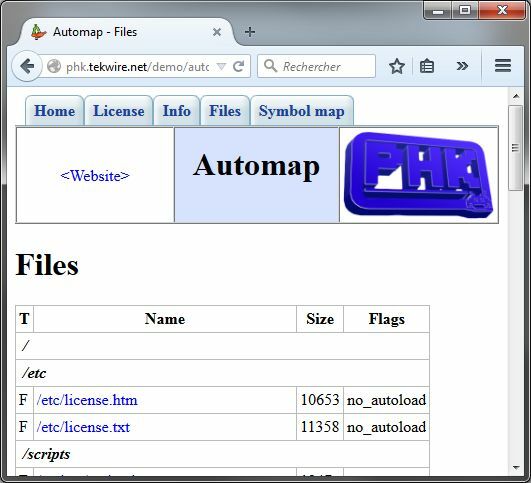 It displays the license subfile. This page displays technical information about the package. The displayed size is the original uncompressed size. This page displays every symbol defined in the package's subfiles. For each symbol, you will see its name, type (function, class, or constant), and the name of the subfile it is defined in. Clicking on a subfiles's name displays this subfile's content. This tab is displayed only if the package defines unit tests. When clicked, it runs the package's unit tests. The script's output must be in HTML format. Most packages provide only CLI-mode tests because it allows to get rid of the max_execution_time PHP parameter. In this case, the test script should test for CLI mode and, if it is not the case, display a message asking to run the tests in CLI mode. The package can define its own webinfo pages. If it is the case, your page will display some additional tabs, along with the default ones. A PHK package can execute several built-in CLI commands. The role of these commands is to display the same information as the webinfo mode, in a CLI environment. To run a built-in command, just execute your PHK file through the CLI PHP interpreter (generally /usr/bin/php) and provide the built-in command as second argument. Every built-in command starts with the '@' char, meaning that CLI programs ported to the PHK format should avoid using such a string as 1st argument. In order to list the available built-in commands, run you PHK package with a single '@' argument. The '@' command displays the list of available built-in commands. Arguments: a non-existing base directory where the package content will be dumped. This command extracts the whole subfile tree out of the PHK package and creates the corresponding file tree under the directory given as argument. This command is rarely used as, normally, you never don't need to extract files from a package. This command displays a subfile's content on stdout. if the 'help_prefix' option is defined, this command will display the corresponding document in text mode. If the option is not defined, it will display '<No help file>'. This command will display the same information as the 'Home' page in webinfo mode. if the 'license_prefix' option is defined, this command will display the corresponding document in text mode. If the option is not defined, it will display '<No license file>'. This command displays the value corresponding to the supplied option name. If you want to display every option that were set when the package was created, use the '@techinfo' command, which displays the whole options array. This command will modify the PHK package's 1st line, so that it can be executed as a Unix script. When a package is created, the interpreter string is not set. Setting the interpreter string on a PHK package will make it usable only as a CLI command, as any attempt to include or run it as a web script will display the interpreter line. To remove the interpreter setting, run '@set_interp' with an empty string as argument. If the PHK package is signed, running @set_interp does not invalidate the signature. This command is similar to the webinfo 'Files' page. It displays the list of subfiles contained in the package. This command is similar to the webinfo 'Automap' page. 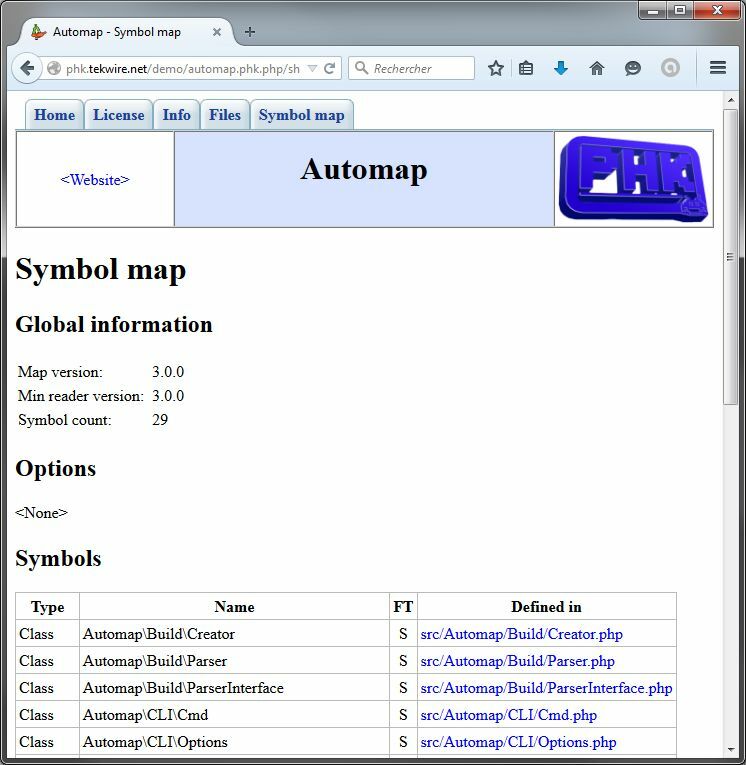 It displays the list of symbols defined in the package with the corresponding subfile's path. This command is similar to the webinfo 'Info' page. It displays the technical information about the package. Runs the package's unit tests.